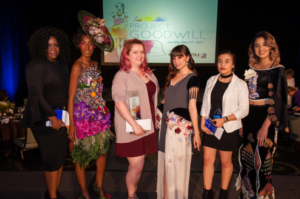 FORT WORTH, TEXAS (May 2, 2017) – Goodwill Industries of Fort Worth, Inc. hosted Project Goodwill, a fashion show, design competition and fundraiser gala supporting the mission of the nonprofit. Aspiring designers from the community were tasked with designing wearable garments using $100 worth of unconventional materials from local Goodwill stores and presenting those looks in a runway show during the event. Over the years, participants have used materials including lampshades, album covers, tin-foil pans, air filters and more to complete their looks. While all fabric had to be from a Goodwill Fort Worth location, trimmings/notions could be purchased from a location other than Goodwill Fort Worth. Materials used in the design were reimbursed by Goodwill up to $100. Contestants could use clothing as material, but it had to be completely reworked, for example taking the material from pants and turning it into a skirt. The fashion show was judged by industry professionals including Joe Allen Brown, Professor of Theatre Arts at Texas Wesleyan University; Melina Mayfield-Williams, Assistant Buyer at Neiman Marcus; Kanani Mahelona, Design Consultant; Ashley Griffin, Manager of Digital Marketing at Highland Park Village; and Debby Stein, Chief Improvement Officer at Riverside Arts District. Contestants competed for top honors in design materials and method, and runway presentation. Project Goodwill, sponsored by Omni Fort Worth Hotel & Beth and Craig Collins, benefits the mission of Goodwill – to empower people with disabilities, disadvantages and other barriers to employment so they may achieve maximum independence. All proceeds go to the Moncrief-Ryan Scholarship Fund supporting initiatives focusing on the homeless, at-risk youth, post 9/11 veterans, the disadvantaged and the disabled.